Experience has taught us not to expect much from large pockets. Indeed all the pockets found in August, and there were many, contained only quartz crystals and a few apatites. As teasers, the lower pocket especially contained many beryl casts in feldspar and albite. Thousands quartz crystals were piled in these pockets and attached to the walls. The roofs and backs however were typically albite and microcline crystals with beryl casts. 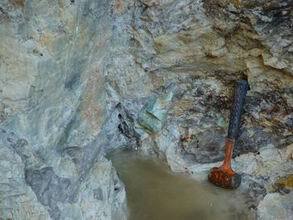 In isolated small chambers, filled typically with manganese mud, we found a few gray and green apatites. With the help of Ray Woodman, we were able to save quite a number of quartz groups in various sizes and configurations. It became clear that at the level we were working there was still more to see below our feet. Punching the floor deeper was a best a nasty business as we were working now at the lowest level in our pit. This essentially meant that even with continuous pumping we were still standing in water constantly. Not too bad in August in the midst of a heat wave. If you did not mind being splashed with water, drilling the burn holes was not bad either. Fortunately or unfortunately depending on your perspective, our burn holes encountered massive quartz and pockets. This meant that loading these holes with explosives was a major ordeal. Since the walls of the holes were crumbly with quartz and pocket material it seemed that these holes healed themselves as fast as we could drill them. Opening them up to load required the use of our blowpipe. Its like going to the water park and getting sprayed with rocks as you let go a 120 PSI blast of air into a blocked 2" drill hole. With persistence and a little bloodshed, we were able to load and shoot these holes. Each attempt at driving the pit deeper seemed to win us about 2-3 feet. It appears now that we have encountered another core zone at depth. 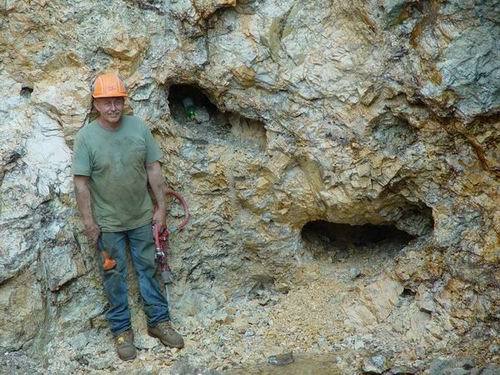 Behind us westward, the pegmatite at this level was very fine grained. Now we were, despite our best efforts to go deeper, still looking at very large microclines in quartz in the floor. Also, there were many very large quartz crystals faces embedded in these masses. Faces that are in some cases 2 feet long. What we were missing at this point, besides of course buckets of gem beryls, was beryls in matrix. We were encountering a few but not a sufficient number to tilt the odds towards finding them in pockets. Soon we had driven all of our benches down to this new level and it was time to take another slice off of the schist mass ahead. With each slice we draw closer to the high wall where critical decisions will need to be made. Fortunately, after each vertical section is removed from this schist, typically 8-10' at a pass, the schist mass diminishes. Now the pegmatite in the left hand pinch is wide enough to show better crystallization, small masses of quartz, a few beryls and some pockets. Interestingly, some of these pockets are are within inches of the schist. 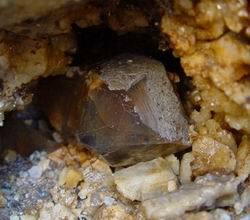 These small pockets have produced a number of scepter quartz crystals like the large one shown here still in it's cavity. Now beryls seemed to be getting more abundant. After each shot, and as we walk back into the pit, a measure of the productivity of the new bench will be whether or not beryls are lying ejected into the road. Now they were. Beryls even where abundant in the green masses that appear to be schist blocks that have fallen into the melt. The habit and association of these beryls is somewhat different and reminiscent of some Brazilian emeralds I have seen....except these are a pathetic gray-green. Since there is little exchange between the pegmatite and the country rock at the interface, the only chance for the introduction of other chromophores is the alteration of these zenoliths in the melt itself. There are 5 beryls on this side of the piece shown here. We had now spent a record 3 weeks of continuous work. We had failed to hit a home run even though it was clear the trend was our friend. The last day of any mining trip is a day of desperation. Careful carving out of the pegmatite to enhance further mining is thrown to the wind...it becomes like one of those15 minute shopping sprees. So on Saturday September 1 we were down to the our last chance for this time. The first bench, a 4' slice just under the schist, produced more beryls of mediocre quality but again the quantity racheted up another notch. More smoky quartz bleps with beryl were showing up too. We decided to take another 4 feet down. As we drill, I am always examining the cuttings to get a jump on what we are about to see. Almost always I read them wrong. This time I was impressed by the white color of the cuttings and the seemingly high percentage of quartz. 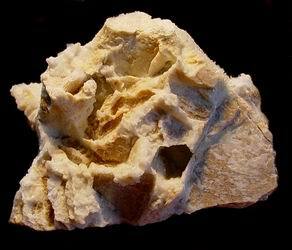 The number 2 drill hole produced a dust of a different texture and color than feldspar or quartz. This last bench was about 4' up strike and slightly above the large pockets shown at the top of the page. 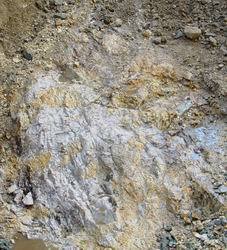 Once we were able to get back into the pit after the blast, we saw that we had exposed a zone of pink and white feldspar with more smoky quartz. The spar was bladed and had manganese dendrites at the margins. These dendrites are a very reliable pocket indicator at the Orchard. The source of the odd dust was revealed as well. 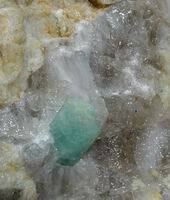 I had managed to drill right through a very large blue-green beryl. In the few minutes we had to hoe through the material, we made several interesting finds. 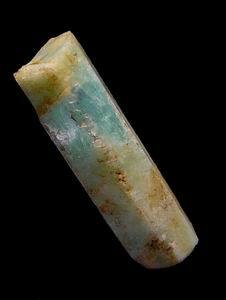 The first was a doubly terminated blue beryl. It is a little suspicious that this lightly etched beryl could have been blasted from matrix so cleanly. 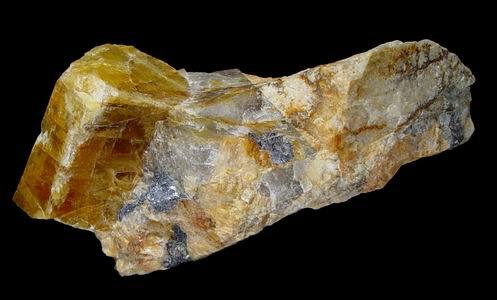 While Richard was sitting down to take a rock out of his boot, he found a very yellow beryl with columbites and smoky quartz. This piece too was blasted out surprisingly clean. 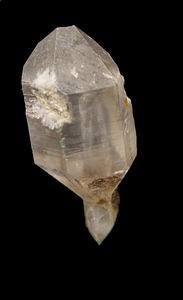 Next Richard found a scepter quartz crystal. Apparently we had at a minimum blasted out a small vug. What also seems to be holding is the mineralization sequence we saw the last time we encountered a beryl pocket zone. 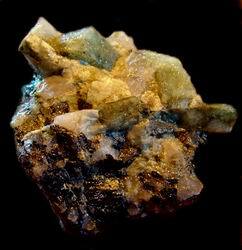 The sequence appears to be (1) large pockets with quartz crystals and beryl casts (2) decided increase in beryl concentration in the surrounding rock (3) a zone of bladed soda spar.